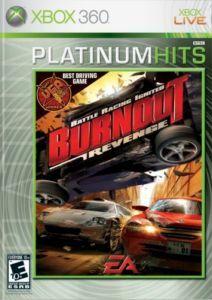 The next-generation debut of 2005's racing game of the year, Burnout Revenge slams into the Xbox 360 with a suite of new online features set to define next-generation automotive anarchy, jaw-dropping high-definition graphics and the retina-searing speed that the Burnout series is famous for. Through Xbox Live, the brand new Live Revenge feature tracks your rivals and calls out those that need some serious payback. Build up relationships with gamers that you take out, or take you down, and then let Live Revenge recall them and tell you how they are intensifying. It's about long memories and short tempers. Have you just been part of the most destructive crash in video game history and everyone missed it? The all new Save and Share feature enables you to highlight those "oh my gosh" moments from your replays so you can share them via Xbox Live&#153;. Download your friend's replays and rate them, or check out the Top 20 Most Downloaded. The Xbox 360 enables Burnout Revenge to deliver the most spectacular crashes in the series' history. Next generation crashes mean vehicle deformation, highlighted with localized scratch, crumple and scorch maps, Hollywood-inspired special effects and bigger explosions than ever before. Burnout Revenge on next-gen still features multi-level tracks designed for fighting, wicked vertical takedowns, explosive crashbreakers, a huge array of gameplay modes and wide open crash junctions for epic crash sequences that put Hollywood to shame, Burnout Revenge redefines speed and aggression for the ultimate in vehicular combat. Live Revenge - It's not just about winning, it's about vengeance. A persistent Live Revenge mode tracks your relationships with online racers and rank leaders, calling them out in each race ... know your rivals and punish them! Save and Share - Give back to the online community ... Save your greatest moments and upload them on Xbox Live for the world to see. Crash Redefined - Show Hollywood how it's done with all-new open-ended crash junctions, now including 10 new junctions exclusive to Xbox 360. With multiple start points, complex, vertically-oriented tracks and hundreds of cars begging to be decimated, Burnout Revenge is the king of crash. Built to Battle - Designed for maximum carnage, Burnout Revenge's tracks are loaded with massive jumps, multiple paths and nasty chokepoints to deliver the ultimate brutal car combat. Vertical takedowns and in-race crashbreakers open up new avenues for destruction. Watch out for shortcuts, highlighted by flashing blue lights...they're everywhere. Car Classes - All-new cars in three classes (race, muscle and crash) accentuate different play styles. Choose your weapon!